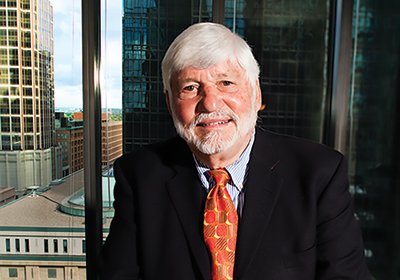 Tom Hubler, who founded the Minnesota Family Business Awards in 2008, helps families pursue their financial and emotional future. A family running a business shouldn't forget that it's a family. That's one of the essential messages that Minneapolis-based family-business consultant Tom Hubler tells his clients. "One of the things that distinguishes me is [my emphasis on] building what I call the emotional equity of your family while you're simultaneously building the equity of your company," says Hubler, founder of Hubler for Business Families. Business and financial differences can "really ruin family relationships unless you're proactive." Families in a business need to build the emotional equity they need to get them through challenging times, and one way of doing this is by maintaining family rituals such as holidays and other celebrations. "At the time, there were only a handful of people in the country, and nobody here in the Twin Cities, doing succession planning for family businesses," Hubler recalls. In 1988, he and business partner Steve Swartz sold the practice, called Hubler/Swartz, to tax and consulting firm McGladrey. Hubler worked there providing similar services for three years until he launched a consultancy called Hubler for Business Families, whose work extends beyond succession planning to a broader array of services for family businesses, including drawing up business plans and formal ownership structures. Since then, Hubler has worked with dozens of family businesses of all sizes. Most of his clients are local, though he has worked with companies elsewhere in the country and in Canada. He has taught at St. Thomas and at St. Catherine University, and continues to teach, write, consult and speak. Ask Hubler what family businesses should be doing more of, and he answers: Plan. "Family businesses, when they start out, are very entrepreneurial, and they don't need a lot of formal planning," he says. "But as they go from the start-up stage or the early stages â€¦ they need to become more formalized." These formalities include creating a clear succession plan, as well as conducting regular family meetings about the business and setting rules for how members should prepare for joining the company. "Families in family businesses often say, "We don't need that formality and structure because we love each other,' " Hubler adds. "I say to them, 'It's because you love each other that you need structure and formality.' "
It's that approach of blending structure and emotion that has worked very well for Murphy Warehouse, a Minneapolis-based third-party logistics and warehousing company. About 10 years ago, Hubler was hired by president and CEO Richard Murphy Jr. to "help us go through a challenge that we had." Hubler met with all the parties involved, then brought them together to resolve the issues. "He doesn't take a position per se, and he shouldn't, either," Murphy says. "He listens to all sides, and he helps everybody to understand whether they're communicating information correctly and interpreting it accordingly." For a family business to persevere, both family and business need to flourish. "The research [shows] that when the family is in harmony, it goes straight to the bottom line," Hubler says. "Families in harmony are more profitable."